Chiran area tea fields of Kagoshima Prefecture with Mt. Sakurajima in the background. KagoshimaTea.com was purposely designed to be easy to navigate and understood by everyone. Please notice on our shopping pages that the package weight and cost of all products are clearly shown for ease of comparison. We strive to provide accurate product descriptions by avoiding excessive hype and misleading language. Finally, when you arrive at our shopping cart checkout page you will not be surprised by additional charges. Our objective is to help you be well informed before making your purchase decision. From its beginning the Kagoshima Tea Producers Association has set very high standards for the traceability of its tea production and distribution via its tightly regulated and computerized wholesale marketplace located in Kagoshima City. 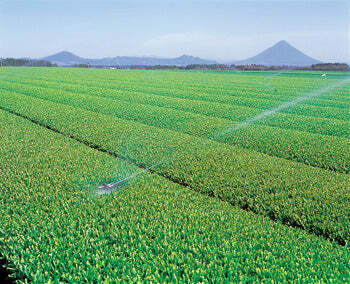 The green tea products offered at KagoshimaTea.com are 100% traceable. We know precisely where our products come from and exactly what goes into every package you receive. All our suppliers are certified by the ISO (International Organization for Standardization). This is important during a time when there is considerable concern for food safety worldwide. To receive certification tea producers must comply with strict standards for cleanliness, safety and good management practices. Learn more about the ISO at http://www.iso.org/iso/home.htm. Since the Fukushima nuclear disaster of March 11, 2011 green tea throughout Kagoshima Prefecture has been thoroughly tested for radiation and none has been detected. KagoshimaTea.com is the first and only English language business to offer a complete selection of high quality green teas grown exclusively in Kagoshima Prefecture. Our products are sourced directly from the leading Kagoshima tea farmers and producers via our buying office located in Japan. Third party distributors are never involved. Further, we work closely with our suppliers to keep quality standards consistently high. The products we ship to our customers meet high standards of excellence. If for any reason you are not completely satisfied with any of our â€œconsumer-packagedâ€ products, please provide us with your purchase information, and we will, without question, give you a full and unconditional refund (excluding applicable shipping fees). There is no need to return the product. You may make use of it as you desire. We reserve the right to limit future sales to anyone who takes unfair advantage of this generous privilege. "SAVE 25%" retail purchases and wholesale orders are not included in our Guaranteed Satisfaction policy. KagoshimaTea.com does not depend on excessive profit by charging high prices. Our success derives from satisfied customers who continuously return to make repeat purchases. In turn, we purchase in large quantities at true wholesale prices directly from our suppliers and pass the savings along to you. Because our buying office is located in Japan, it is not necessary for us to make costly overseas buying trips which add to the selling price of your tea. Please compare prices before you make your purchase decision and you will find we sell for less, in many cases significantly less, than our competitors for the same or very similar products. Free shipping is effective for all consumer orders shipped worldwide of $40 or more. Orders of less than $36 will be billed a flat rate of only $5 for shipping and handling, while those of $36 to $39 at only $2. For a limited time, purchase four packages of the exact same product and we will send you a fifth package free of charge. This represents a 25% savings on your total purchase. You may make use of this offer as many times as you like and there are no other limits. â€œFree Worldwide Shippingâ€ is included for all qualifying orders. Our â€œGuaranteed Satisfactionâ€ policy applies to only the first package purchased. If you are not satisfied with your purchase, the four remaining packages must be returned to us unopened (at the buyer's expense) to receive a full refund. We suggest that new customers first make a purchase of one package of a particular product before taking advantage of this offer. Our customer service team has been actively involved in the Japanese tea industry since 2000. This extensive experience has made us knowledgeable about how to source the right green teas at the best prices for our worldwide customers. Equally important is our superior customer service gained from serving thousands of satisfied consumers. We are proud and honored to be green tea merchants who offer products that enhance people's health and well being. Our customers often comment to us about the light and refreshing taste of Kagoshima Green Teas along with the subtle and complex flavors of the various products. Strong, bitter and overpowering taste reports are unheard of.